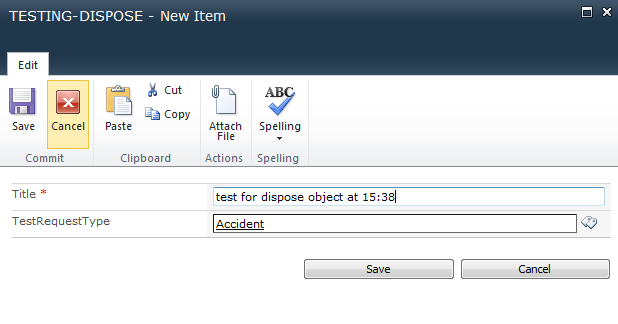 I have the SPRequest object was not disposed error. $file = $Env:CommonProgramFiles+"\Microsoft Shared\Web Server Extensions\14\ISAPI\Microsoft.SharePoint.dll"
# Display and change the setting of property "CollectSPRequestAllocationCallStacks"
the script works but doesnt change the message in the log. I have used SPDisposeCheck and it doesnt return anything. I don't believe this link or this link provides any more information either. Is there anything else I can do to determine where the object was allocated? If this message is shown to occur in Microsoft SharePoint code, what can I do to fix and what is the risk of doing nothing? I noticed the error is also appearing when the list item is updated. On Clicking Save in my custom web part this code is run.. The SPRequest object was not disposed error appears on completing the Redirect line, which basically redirects to the same page, but if I dont execute the line the error still appears. I've commented out all code in my ItemUpdating(SPItemEventProperties properties) method. For a bit more clarity in tracking this down, I have commented out the whole SPItemEventReceiver class on this list. Not sure if relevant but as a bit of extra information this list has custom security applied, and it has a managed meta data column. I can't see a place where you leave an open web opened - the risk is higher resource usage for a longer time, if you dispose properly you would need less resources. If this event receiver is not used frequently, I would ignore it. Can you show some code in what your doing in your list event? Somewhere you're not disposing of the spweb or spsite object. Just like when you use itemUpdating event and then you update the list it would run into an endless loop, adding this.EventFiringEnabled = false; would solve it. In your case I need to see code to know exactly what is causing it to show that error. There is a leak somwhere within the event reciver. So your looping once and the object is disposed and then it loops again with the same spweb / spsite object but it fails becasue the object doesnt exist. this.EventFiringEnabled = false; forces no method to run before you update, so you update first and then what ever other function is going to run does run. I see the real problem now: You recurse with your item.update() call. The memory leak could occur when SharePoint stops this recursion.